Almost immediately after the introduction of the +1 button, people began selling +1s with the attached claim that it would help your SEO; specifically, that getting more +1s improve your ranking in search results. Most SEO professionals will agree that +1s help with SEO, and that concession is the end of the matter for most people. The truth is a correlation between +1s and search ranking hasn’t been proven to exist. When SEO professionals and Google say that +1s help with SEO, they’re referring to Google’s search plus your world. When web professionals use the term SEO, most people automatically think about ranking first on Google. SEO stands for search engine optimization, and it means exactly that. If I could change the background of my listing to bright red, that would be a form of optimization because searchers would be more likely to notice me. While Google doesn’t give you that kind of control, there are other things you can do to optimize the actual listing that will improve your click-thru-rates. 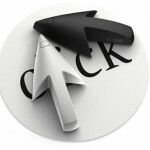 Listings that are annotated as personal search results improve the amount of click-thrus considerably. Backlinks have traditionally made up the biggest factor in offsite SEO, and will continue to do so for the foreseeable future. Many SEO professionals however are beginning to feel like social signals can be used to rank content more efficiently, and would produce higher quality results. There is still too much room for abuse for Google to rely entirely on likes and re-tweets to rank content, but studies are already beginning to show a strong correlation between ranking and signals from social networks (which could possibly be a direct result of more traffic coming from a more prominent search rank). Even though social signals can’t help you in a general search, they can dramatically increase your traffic from users who are signed in to Google+. Google has begun to highlight content that has received a +1 from people in your network while you’re logged in to Google+. Content that you or a friend has recommended are referred to as “personal results”, and are denoted by a small icon next to the results. Personal search results are denoted by a small icon next to each listing. You will receive personal results if you are logged in to a Google Plus account and haven’t disabled personal results. 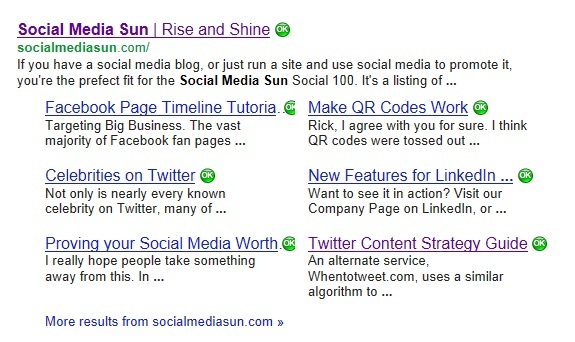 Google search has also heavily integrated Google+ pages in their results. Contextual profile and brand pages are displayed in the right hand column of search results for many terms, including influential celebrity users for broad searches. When a user initiates an implied branded search, the brand’s profile page along with their most recent posts appear in the right column. 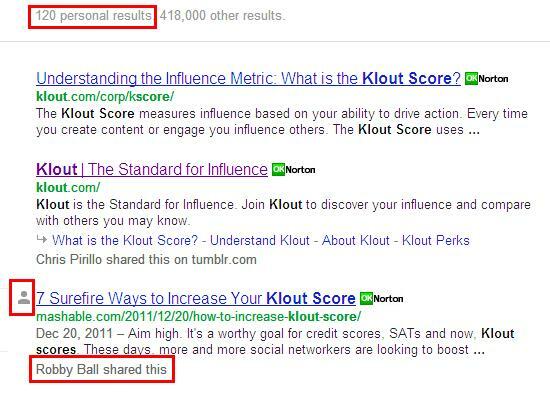 Google+ pages will usually gain priority over other branded social media profiles in regular SERPs as well. 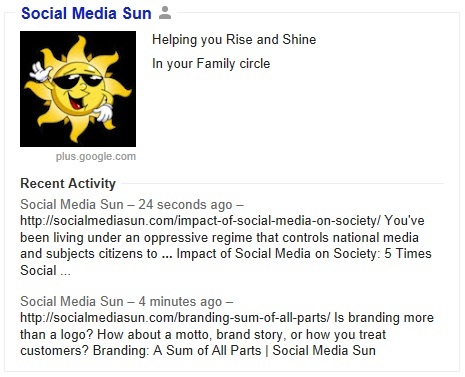 A search for Social Media Sun will bring up our Google Plus brand page as a result in the right column along with some of our most recent profile updates. One of the most obvious results of including personal results can be seen when you search Google images. The very first results will be taken from the public galleries of people you have in your circles if there is anything relevant. The photos that are included in this way are labeled with the name of the friend that they came from. Relevant images from friends’ Google Plus albums are displayed at the top of image search results. The most important thing you can do in regard to social signals is to make the sharing and other social action buttons as prominent as possible. There are several WordPress plugins and integration widgets available to make this easy for you. As an author and publisher, one of my favorite advances associated with Google’s new Schema markup standard is the introduction of rel= snippets. Google uses the information you provide to associate Google+ pages with your existing web properties. You can identify your brand as the publisher of a piece of content, and you can tag your Google+ profile as the author. When you complete the required steps, Google will display your avatar and a link to other content associated with your profile in the search results. In a page full of text, a small photo can draw the searcher’s eye to your listing. It also makes your content more trustworthy because you’re publicly claiming your involvement. The subtle addition of the author’s photo to your listing can dramatically increase click-thru-rates. To properly add a rel=author tag, you need to link your name in the byline to your Google+ profile and include the proper attribute. You’ll also need to add the domain your content will be displayed on to your list of “sites I contribute to” on your Google+ profile. It’s even easier than it sounds, and the dividends can be significant; one study showed a 150 percent increase in click-thru-rate. All it takes is your picture in the search results to dramatically increase the chance searchers will click. Researchers have also shown a correlation between click-thru-rate and profile picture changes, so go with your best profile picture. There are also snippets available for products, recipes, reviews and events. Product listings will display price, user ratings in a graphic format, reviews, whether or not the product is in stock and product categories. If your result has a five-star rating in a page full of bad ratings, buyers will likely flock to your product page, and you may even get an advantage in SERPs. Recipe listings include a picture of the food, user ratings, preparation time and even how many calories. The additional information displayed as a result of the product listing Schema will help tremendously if your prices are fair, the product is good, and your customer support is great. I’m always surprised at the number of people who spend hours each week working on SEO, but neglect using Google webmaster tools. Google developed the application to help you help them. When it comes to adjusting your sites actual listing in results pages, there are two primary tools you need to consider. The first is your canonical URL. Under Webmaster Tools>Configuration>Settings you have the opportunity to select whether or not Google includes a www in your site’s address. You need to make this decision early on and stay consistent – to avoid duplicate urls and to condition users to refer to your website in a consistent manner. Having your address in the SERPs match your existing branding is an important first step. Finally, Google will generate a list of sitelinks under your site’s search results. These will normally include pages like your About page, Contact page, public Sitemap, Blog and other web standards. In some cases, Google will pull pages that aren’t relevant to a user who is searching for your website. Most implied brand searches will be initiated by users who want to learn more about, or contact your brand. Your core pages are especially pertinent to users who searched with the name of your business or website. Use the feature located under Webmaster Tools>Configuration>Sitelinks to demote pages from being included in your sitelinks. Instead of pulling pertinent pages from our menu, Google has instead chosen a random assortment of articles to list as our sitelinks. An often overlooked piece of information included in Google’s search results is the tag generated by anti-virus software stating that the listing isn’t malicious. Users who have gotten viruses through search will be more prone to avoid a site that isn’t tagged as safe. In 2011 39 percent of traffic to malicious websites was a result of poisoned search results. Norton safe web checks websites for 18 different types of threats, including everything from phishing attacks to Trojans. You can test your website through Norton’s testing application, but just because your site is clean now doesn’t mean it is every time. Avoid installing third party scripts and ad servers that aren’t supported by a large company. Take extra precautions with your own security; change passwords frequently and keep all your software updated. Lastly, do not engage in any suspect activity yourself. If you aren’t 100 percent positive that using a script or tactic is ethical, then it probably isn’t. The safe web tag is easily overlooked when results pages are filled with them, but users searching for an elusive piece of information will appreciate the assurance that looking up the price of an old baseball card will not lead to reformatting their hard drive. Getting tagged as a malicious website can cause more damage than losing your web safe approval; you could be removed from SERPs altogether, and dozens of popular applications could identify your site as malicious, blocking direct access from their own sites and applications. If you are currently getting a sizeable percentage of your traffic from search, these changes can yield instant results. If you haven’t mastered on page SEO or suffer from a negative backlink profile, you should probably focus your optimization on those areas. Regardless of where you stand, semantic markups and social media signals promise to play a larger role in search in the future. This type of evolution separates the forward thinking from the layperson. Don’t get left behind. Thank you very much, so complete. Finally an article that doesn´t repeat the same song we´ve been hearing for a while. something out their readers would benefit from also, or stumbled onto something that they thought was cool. Blogging worked in the beginning because readers were a lot like the bloggers they followed. If you liked funny pictures, you’d like my funny picture blog. 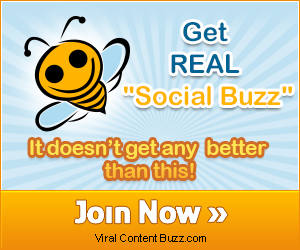 Too many social media, marketing and SEO blogs are written by people who don’t work at it every day. They aren’t coming across the new cool things or finding out old useful tips themselves, and their content suffers because of it. I know what I’m trying to accomplish here, and it’s the feedback from readers like you that inspire me to go forward, and keep writing as much content myself as is possible. Thanks!